I have tried kulcha without yeast at home only once when I prepared Punjabi lunch menu and that too it was stuffed Amritsari aloo kulcha, not the plain one. I have forgotten the taste of all the other recipes I tried for that Punjabi platter but I still remember the softness of the kulcha. At that time I had followed the recipe from “The Hindu-Food Safari” Section which was an excellent, fool proof, easy kulcha recipe without yeast. So I made this butter kulcha following the same recipe for our Sunday breakfast. Kulchas are meant to be too thick & round but I made it thin as per my family’s likings. It came out really awesome. I couldn’t believe when Raksha had 3 kulchas and asked for more !!. Not just Raksha, even Sendhil & myself loved its softness very much, though we felt bad about the maida used in it. Sendhil was asking me the difference between Naan & kulcha. So I browsed & found some points which I have shared them below. He told me to try the same recipe with wheat flour too. I must give it a try. I made Restaurant style dal fry as side dish for Kulcha. It was a lovely combo. 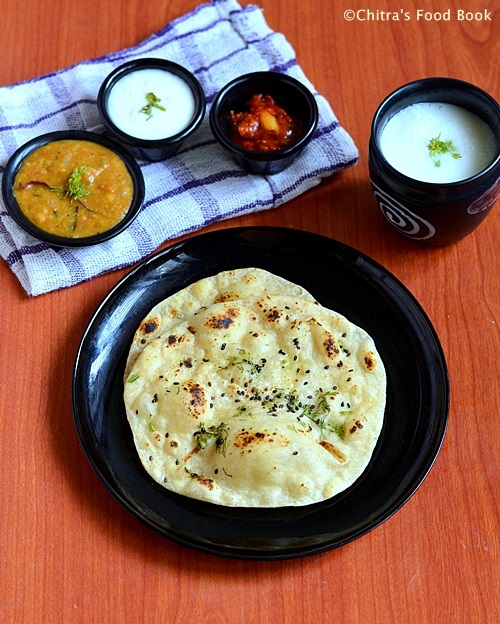 Friends do try this plain kulcha recipe without yeast. I am sure u won’t regret it. Just grease the kulchas with butter or ghee & relish it with the most popular side dish Punjabi Chole or paneer butter masala. It will taste heaven I say ! Naan Vs Kulcha - What is the difference between naan and kulcha ? 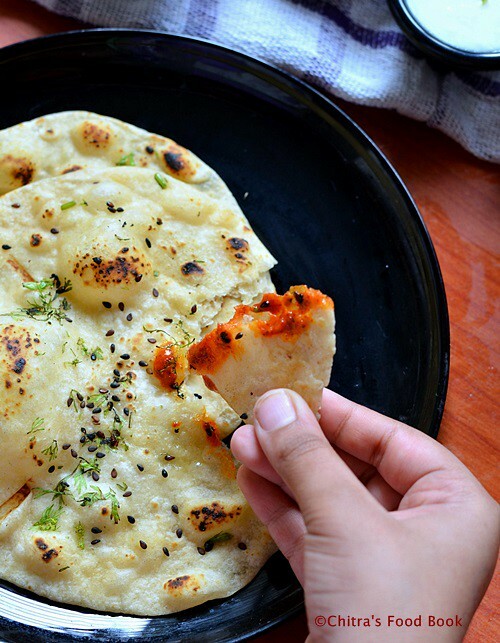 Naan and Kulcha are flatbreads that have Indian origin. While Naan is the more celebrated type of bread, Kulcha is a typical Punjabi bread that has old Punjabi traditions. Naan is made in oven or earthen ware made of clay using charcoal to provide heat to cook the bread whereas Kulcha can be made on stove top too. Naan is made with yeast and sometimes with milk and yogurt to make it soft and also to give it a bounce. But Kulchas are made using baking powder, baking soda, milk & yogurt to give softness. Although Kulcha is similar to naan in looks and flavor, it is typically thicker and fluffier than naan. Naans are usually oblong in shape while Kulchas are round. 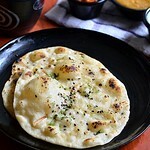 Ok, Lets see how to make this soft kulcha recipe with stepwise pictures. In a wide bowl, sieve the maida, baking powder, cooking soda & salt. Make a well in the center & add the oil,sugar and curd. Mix well to make a crumbly mixture. Now add the warm milk and mix well. Lastly add the warm water little by little & make a soft, non-sticky dough. Knead it for 2 minutes and set aside. Making a non-sticky dough step is very important to get a super soft kulcha. Cover the dough with a damp cloth and let it rest for minimum of one hour ( I rested it for only one hour and not more than that). After an hour take the dough and make golf sized balls. Cover all the balls till use. Take one ball and dust it with maida only once. Roll it to a thick, round shaped kulcha and sprinkle some kalonji seeds & chopped coriander leaves on one side of kulcha. Just press it well with your hands or using the rolling pin roll it over the kulcha. They will be studded well. Now heat a weightless non-stick dosa pan. Take a kulcha and apply water on one side. Drop the kulcha onto the pan such that the water applied side should face down and kalonji side should be up. Refer picture below. As soon as you put the kulcha, you can see some bubbles appearing all over the kulcha. Immediately flip the pan & show it over the burner. The flame should be high. Dark spots will appear over kulcha. Remove it in few seconds. (As we have applied water, kulcha will stick to the pan and it won’t fall off easily while you flip the dosa pan. Suppose if the kulcha falls down, use a tong and cook it for few seconds over the flame & remove). If u don’t want to flip the dosa pan, you can just remove the kulcha & cook it over direct high flame for few seconds and remove. Grease it with butter or ghee & serve it hot with Punjabi chole, any paneer gravy or dal ! Addition of warm milk & warm water is important for making soft kulcha. You can use milk alone instead of adding water. The dough should be non-sticky & soft. So please add milk & water very carefully. Resting the dough for minimum one hour is very important because the baking powder, soda & yogurt reacts well & makes the kulcha soft. If you are concerned about maida, replace it with wheat flour & give a try. I hope it will come out well. 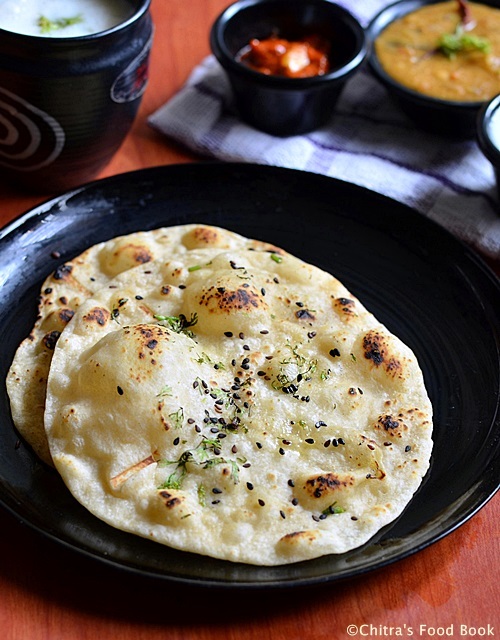 Try this easy super soft kulcha at home. I served it with dal fry, pickle & curd. It was awesome ! I love with pickle more than other side dishes ! these kulchas look perfectly made.will tru it soon. seeing your detailed recipe i feel confident to try it. 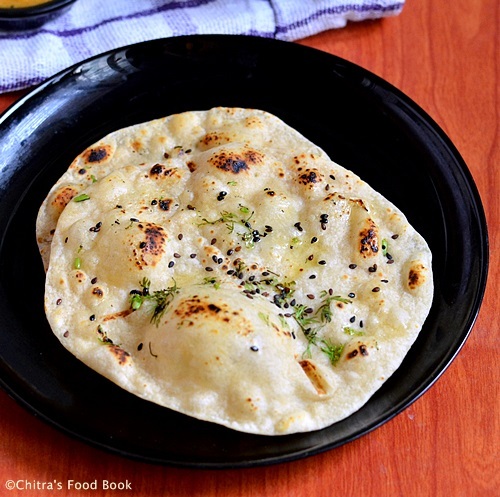 You are making me hungry now..Perfect kulchas.Is Cooking soda and baking soda different?I was thinking both are same.